The trees are giving it up! Even on chilly, blustery days if the sun is shining, the sap is roaring down the mountain. We’ve been making a lot of syrup and the end is not in sight quite yet. This past week the nights have been cold - in the upper teens and low to mid twenties. That is changing as the nighttime temps are beginning to hover around freezing. We’ll see how far we can get. The trees have opened up, and sap has finally started to flow. Yesterday was cold, just around 35F but with the strong sun, we collected about 1200 gallons of sap (or about 2/3 of our raw-sap collection tank). The sap is really sweet this year. We normally have a low sugar percentage -about 1.8% - but this year we’ve been consistently around 2.2%. This makes a big difference in the amount of syrup we make. At 1.8% sugar, we need 44 gallons of sap to make one gallon of syrup. At 2.2% we only need 36 gallons of sap to make one gallon of syrup. We can make 10 more gallons of syrup per full tank of raw sap. We also had a stunning 3% sugar in the open-grown maples from which we’ve hung some buckets. Our friends who sugar a couple towns over also have high-sugar content in their sap. The vacuum has helped us a lot during this late start to the season. Buckets are not filling quickly despite some warm days. We’ve boiled five times and are just about at 25% of our crop. Starting tomorrow it looks like we’re going to get buried in sap! Hopefully we can get through a very-warm weekend and into a cooler next week. By all accounts it’s been a late start to the sugaring season here in our corner of Vermont. The sap began to trickle in on March 12 but really didn’t start in earnest until March 14. Our sap tanks filled on both March 15 and 16, and we boiled both days. Now things have frozen up and it looks like we may not boil again until Wednesday or Thursday. This time last year we had already boiled 7-8 times and were digging out sap lines from under 5’ of March snow! We boil down the springtime sap from 2500 maple trees living on our hillside in Weston, Vermont. All of our sap comes from one sugarbush, so the syrup tastes like Bobo’s Mountain: the soil, minerals, organic material, water and the trees. Bobo's Mountain Sugar is a wood-fired operation, and we use wood sourced either from our land or from our neighbors to ensure our fuel is local. It takes a lively mix of science and magic to make maple syrup, and we wait for those perfect early spring days where night-time temperatures are below freezing and day-time temperatures are above freezing. Then, as the sap is running, we collect it, light up a fire, and boil it down to syrup. When the syrup comes off the pans and you have your first taste of Bobo's Mountain...perfection. On of the best things about sugaring is how closely held we are to the transition from winter to spring: the most powerful seasonal change in northern New England. 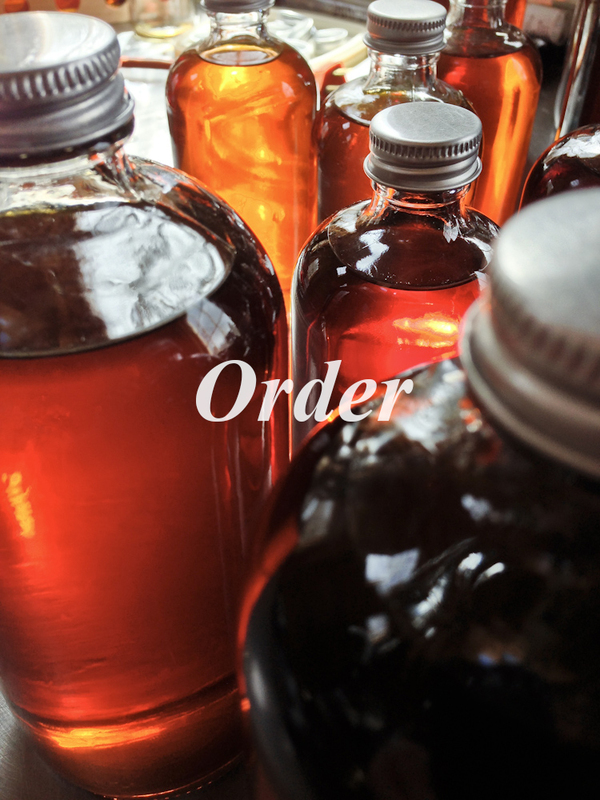 We begin making syrup by fixing lines and tapping trees in deep-winter February. The first March boils are cold and quiet ones – wearing jackets and hats until the sugar house warms up. Outside is still frozen solid. By mid April, we’re boiling with the doors open wearing T-shirts and listening to the first sounds of spring: the Red Sox, the water running down the hill, and the wood frogs singing in the pond. After that, we are back in the woods in sneakers, swatting black flies, and watching the spring ephemeral flowers pop off the mountains. There is nothing subtle about this transition, and it's a gift to be pulled through it covered in sticky syrup. ... I don't know exactly what a prayer is. I do know how to pay attention, how to fall down into the grass, how to kneel down in the grass, how to be idle and blessed, how to stroll through the fields, which is what I have been doing all day. Tell me, what else should I have done? Doesn't everything die at last, and too soon? Tell me, what is it you plan to do with your one wild and precious life? “The Summer Day” - Mary Oliver (1935-2018). Vermont is deﬁned by the Green Mountains, an extension of the northern Appalachian Mountains which run north-south through the state. The name Vermont is said to come from Verts Monts, French for Green Mountains. Although Vermont has some signiﬁcant granite deposits, the majority of the bedrock is calcium rich limestone and shale, a throwback to when much of the western part of the state was part of a giant inland ocean and all the little shelled critters died, sunk to the bottom and became the bedrock. Fortunately for us, sugar maples prefer a calcium-rich soil and its what gives Vermont is lush, mixed temperate forests. The West River valley runs through Weston with Markham and Terrible Mountains to the east and Holt and Peabody Mountains to the west. Even at its lowest points in the valley, the elevation is at about 1500 feet. One can ﬁnd Bobo roaming the southern slope of Markham Mountain, which runs northwest/southeast and eventually goes into the adjacent town of Andover. Bobo’s Mountain is heavily forested in a mixed temperate deciduous forest with primary species including maples (sugar, red, striped), red oak, yellow and paper birch, balsam ﬁr, spruce, and white pine. 10,000 years ago the receding glaciers deposited an unthinkable number of rocks and erratics on the land. The stonewalls which ride up and across the mountainside provide evidence for the early settlers plowing and farming the slopes. While most of the mountain is sloped and even truly steep, there are some naturally terraced areas providing sites for buildings, a pond, a natural vernal pool, and potential pasture.